New Mexico River Map clearly locates the major natural streams of the state. 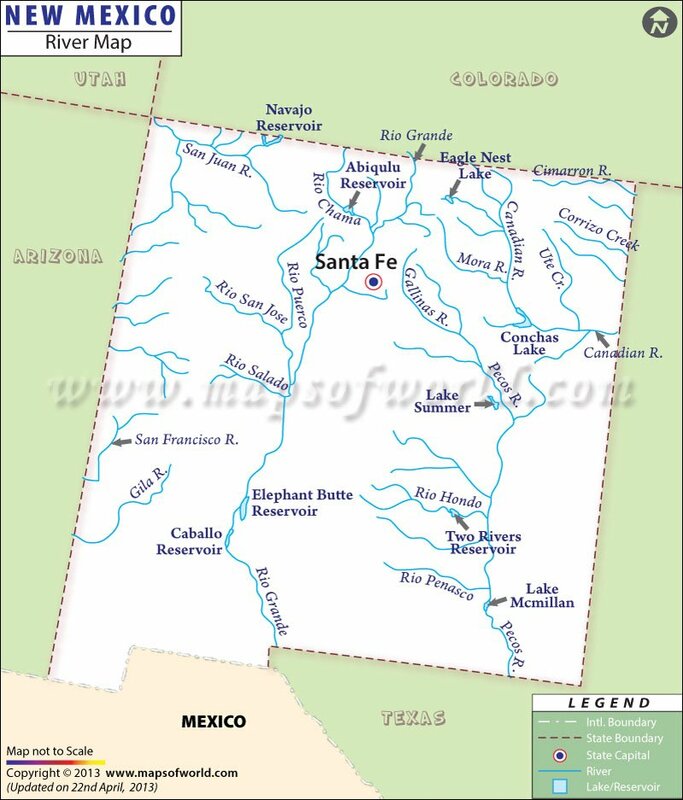 Gila, San Juan, Pecos, Rio Grande, and Canadian are the major rivers of New Mexico. The Rio Grande River passes through the northern part of New Mexico towards the southern part of the state. It is the prime river of New Mexico and the third longest in the United States. The Rio Grande is 196 miles long. Having a splendid natural aura and wilderness areas, the Rio Grande has popular tourist appeal. The Rio Grande Valley of New Mexico boasts fertile soil on which various crops are grown. The Rio Grande River has made a significant contribution towards improved irrigation of New Mexico. The Pecos River of New Mexico intersects the southern parts of the state. The tributaries of Pecos River include mountain streams. Camping and fishing are available in the Pecos River area. The otherwise dry lands of New Mexico have turned into fertile crop fields due to the perennial waterways that flow across the length and breadth of the state. Conchas and Elephant Butte are the two major reservoirs of New Mexico.